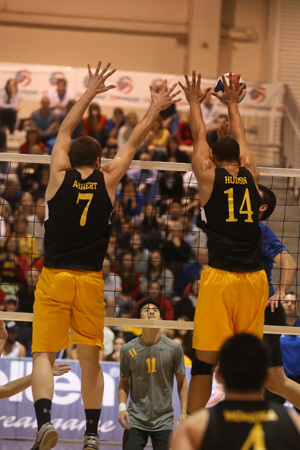 The University of Wisconsin-Oshkosh men's volleyball program was started in 1992 and has become one of the nation's largest and elite collegiate club programs. Over the years, the program has grown to include 3 squads, all of which play full schedules. UW-Oshkosh is a member of the Wisconsin Volleyball Conference and the Midwest 10 Conference, and plays in the National Collegiate Volleyball Federation National Championship tournament every year. In only their second year playing in the National Championship Tournament, Oshkosh won the 1996 Division II National Championship. The next year they moved up to Division I, where the first team still plays today. Our second and third teams play in Division III at nationals. Since 2005, UW-Oshkosh has been the most decorated collegiate club program in the nation. The Titans won the 2006, 2007, 2011, 2014, 2015, and 2016 NCVF Division I national titles and the 2010, 2012 and 2014 NCVF Division III national titles. The Division I team also took home national runner-up awards in 2005 and 2009, while the Division III team added runner-up trophies in 2006 and 2015.